It’s official: Van Halen are hitting the road in 2012. The band has issued a tour announcement preview video, letting fans know the first tickets will go on sale January 10. While no other details were made available at this time, it is expected that a list of tour dates will be revealed prior to the January 10 on sale date. VH posted a few versions of the preview, featuring footage filmed last month at The Roxy in Hollywood; the material is rumored to be from a forthcoming video for a brand new song. 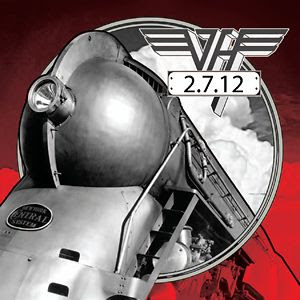 No details, yet, on a single or album release date, but VH did release an image of a freight train with the date 2.7.12 on it (see above). First single? Album? VH has signed with Interscope Records for the project, leaving their home at Warner Brothers Records after more than 30 years. Produced by Ross Hogarth, the new record will be the band’s first with David Lee Roth since 1984 (the year and album).